In an astonishing turnaround, UKIP destroyed the Conservative vote in the borough council by-election in Haverhill yesterday. Tony Brown, who had already snatched a Suffolk County Council seat from the Tories in May, became the first UKIP copuncillor to be elected to St Edmundsbury Borough Council when he took the Haverhill East ward seat left vacant by the death of former town mayor Les Ager. But more extraordinary was the margin of victory. Cllr Brown received 529 votes and the Tory David Roach just 157, finishing third behind Labour's Pat Hanlon on 240. Lib-Dem Ken Rolph was fourth with 54. 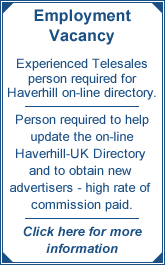 There was also a by-election for the vacant Haverhill Town Council seat, and the Tories did not even field a candidate. UKIP's Paul Firman won with 630, Labour's Liz Smith being second with 229 and Ken Rolph for the Lib-Dems third with 107. Cllr Brown, speaking after the count at the Chalkstone Community Centre last night, said he thought the result sent a message to the Conservative-run borough council that Haverhill was not happy with the way it was being treated. "I hope to carry on in the vein I have been in since May - changing things for the better for Haverhill and trying to make the town what we deserve," he said. "Voters have sent out a signal to the borough, where the Conservative-controlled council is not taking into account the aspirations of the people of Haverhill. "The old parties have failed the people of Haverhill and we are fighting for a better deal for the town. "I think Tories across the country are getting this message." Local Conservatives had broken ranks with other town councillors over the possibility of the town council raising council tax to cover a shortfall caused by the borough not passing on Government cash. Both UKIP and Labour had advocated retaining the special events the town council organises in the town, even if it meant paying an extra £5 a year at band D level. Conservatives initially supported the move, but after a meeting with the town's Conservative MP Matthew Hancock, they came out against it.